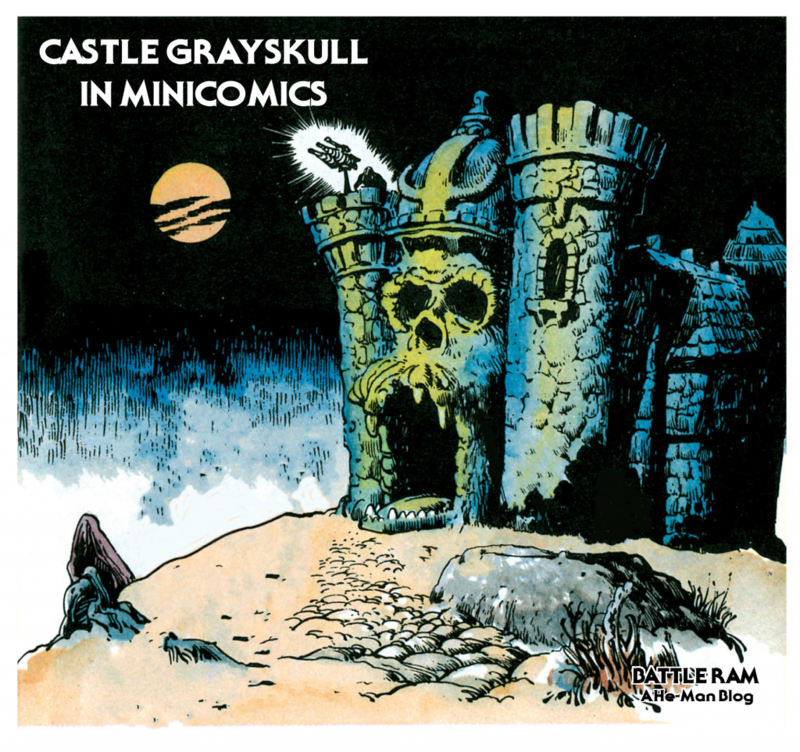 This time around I’m going to take a closer look at Castle Grayskull as it appears in the minicomics. I won’t post a picture of every single appearance of the castle, just a representative sample from every issue it appears in. My focus will be on the exterior, especially the front. 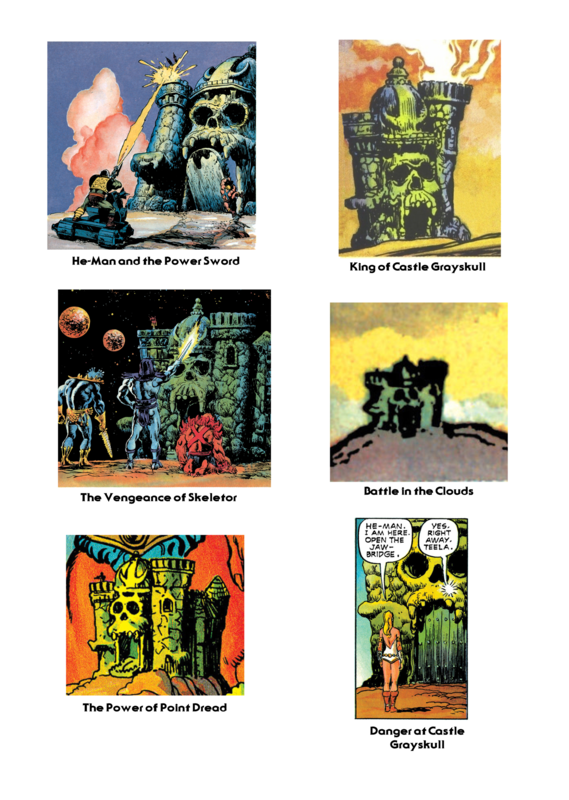 There seem to be two primary influences on the way the castle was depicted in the minicomics – Mark Taylor’s original prototype of the Castle, and the version Mark Texeira drew in the second series of minicomics in 1983. Mark did the original sketch. That was then be sent to the sculpting department. When we saw their rendition, it was awful. It was a square castle, just like you would find in the English countryside! We made a fuss and it was sent back for revision. The second go round was almost as bad. As I remember, it was square with turrets on the corners, very symmetrical. Somehow Mark persuaded the powers in charge to let him sculpt it. The sculpting department was pissed! Mark set up a board in his office and with a bunch of Chevaler sculpting clay, set about modeling it. I took turns helping him, even my nine-year-old son had a go. When that was finished it went back to sculpting for molding and engineering. It makes me wonder if Mattel might have sent one of these discarded attempts to DC to use as a model. I don’t know for sure, but it’s an interesting thought. Note however that some versions of Texeira’s illustration seem just a bit closer to the actual playset than others. It continues to pop up in the 1985 wave of comics as well. One notable exception is Bruce Tim’s illustration in The Power of the Evil Horde. His seems like a mix of many different influences, from Filmation to Texeira to the actual playset. 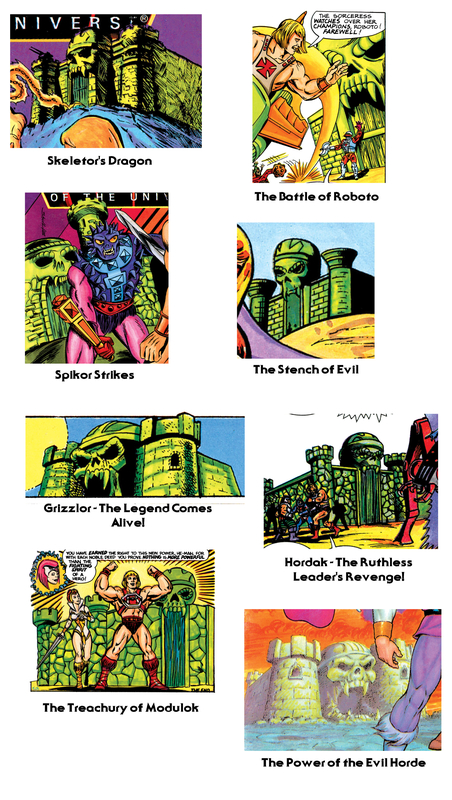 Castle Grayskull sees its final minicomic incarnations with the 1986 series of minicomics. Here the depiction of the castle begins to mutate. While the Texeira influence still pops up here and there, we also begin to see an interesting interpretation from Jim Mitchell, starting with Escape From the Slime Pit. His castle has an almost mummified-looking face, without any of the sharp teeth of previous incarnations. In a way it comes around full circle to the Alcala depiction. 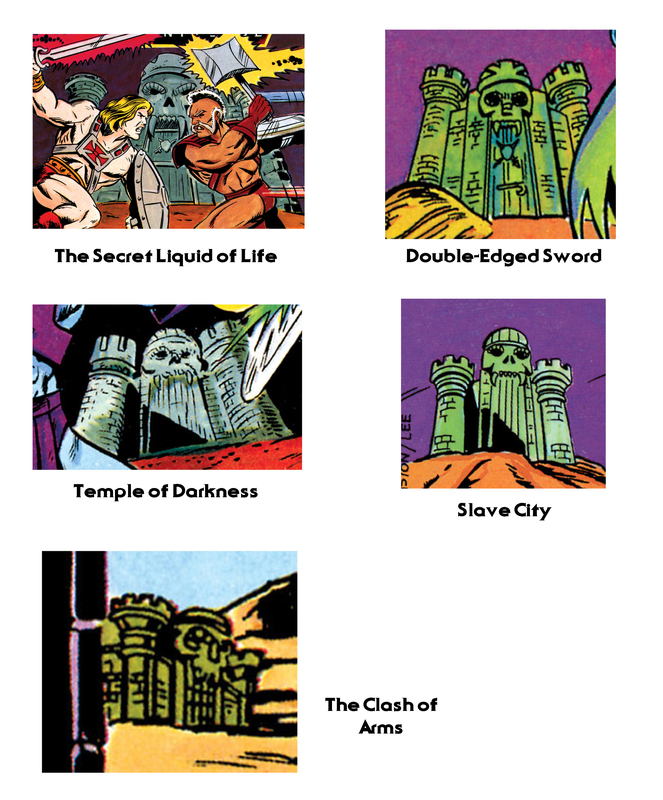 Bruce Tim gives us our final look at the castle in The Ultimate Battlegound, which follows the same look as his illustration for The Evil Horde. More awesomeness, as always, man! CHEERS! still, square box like would be plain and dull.. I never really thought much of the Flimation version of the castle.. as it just made it look pretty silly.. and the idea of it being part of a large creature ¬_¬ even worse.. So using skeleton of a giant freaking beast as a frame for the castle is what makes it silly?! Dude, if that’s silly, then what is a half naked blonde barbarian?! half naked barbarian is about right. depending on the climate. I prefer the original science fantasy world of the earlier stuff where the castle descending in many various time zone levels and was this major stronghold which either good or evil could hold, more then just a stone building build into the skull of some old creature. and they made it more square, made the teeth pretty weird, made the skull look like it was added more then part of it, had them stupid arms etc. 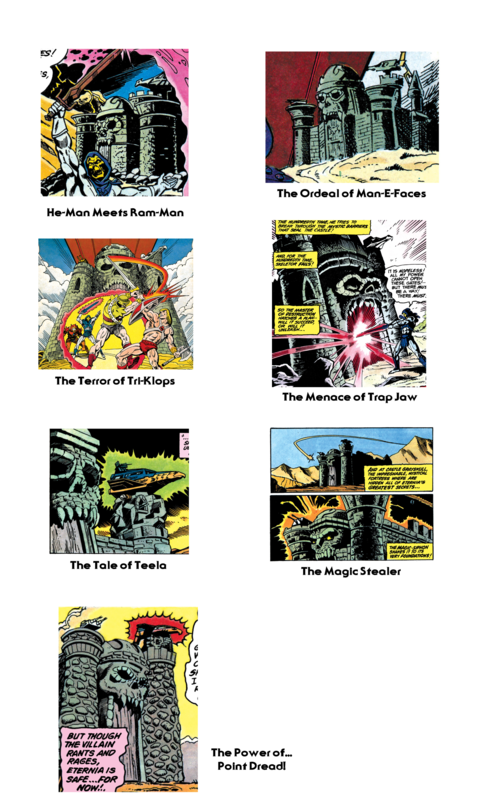 I just was never a big fan of what the filmation he-man was compared to the toys and mini-comics. though as things went on, they merged the cartoon into things more and I feel lost some of the fusion.